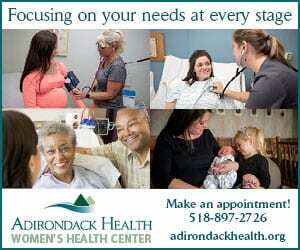 Tourism is a key business in the Adirondacks. About 12.4 % of local employment is tourism related, but only $2 out of every hundred spent on tourism in New York State ends up in the Adirondacks. It’s often argued that Adirondack towns and villages, particularly those outside the High Peaks, Lake George and Old Forge areas, present a challenging environment in which to make a living. Some folks say we should attract manufacturing, others see building more resorts or recreation facilities as the answer, but what about tapping into one of our most important natural resources: wildlife? Wildlife helps drive tourist revenue, and can help create hospitality and infrastructure support jobs. Take for example the experience of Yellowstone where wolves were reintroduced in the mid-1990s, not only to rewild Yellowstone, but also to try and better manage the exploding elk herds, and the ecosystem damage they were causing. The result was an interesting economic development: in data gathered through surveys between 2004 and 2006, it turned out that a high percentage of Yellowstone visitors cited the possibility of seeing wolves as a major factor in visiting. This translated into an estimated $35 million in extra annual dollars spent in the local economies of Gardiner, West Yellowstone, Silver Gate, Cooke City, and the other Montana and Wyoming towns which border Yellowstone. About 3.5% of Yellowstone visitors claimed they had come only to see wolves, and would have gone elsewhere (Banff, Denali, Algonquin, etc.) if there were no chance of seeing the iconic predator. Here in the Adirondacks, the Regional Office of Sustainable Tourism (ROOST) promotes tourism to the traveling public and releases annual reports based on surveys of tourists who interact with the visitors’ center through walk-ins, call-ins, reach out and social media. Hiking is the most popular reported outdoor activity, followed by canoeing and kayaking, skiing and snowboarding, and the ever more popular cycling. 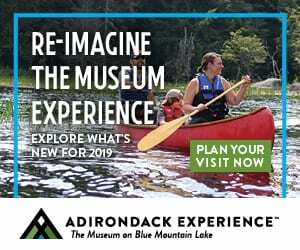 Curiously, the only mention of wildlife viewing in the survey are the Adirondack Wildlife Refuge’s “Wolf Walk”, where visitors learn about wolves. What if ROOST could actively promote wildlife viewing? In the future it could be possible to see elk, wolves, or cougar, if such species were rewilded to the Adirondacks. Seeing such animals would be a remote possibility while hiking (wolves and cougar tend to flee), but a better possibility while canoeing (all mammals come to drink), and a still stronger possibility while simply driving (most wildlife sightings are of animals crossing roads). What if this emphasis on wildlife tourism resulted in only a 10% increase in tourism? That would be over $16 million dollars, not including the tourists who are already more actively engaged with wildlife each year such as birders, hunters, and anglers. In addition to the economic advantages of restoring wolves to Yellowstone, there are success stories about restoring elk to previous habitats where they were hunted-out before the advent of hunting management. In Kentucky and western Pennsylvania, where restoration has been so successful, elk have become an important tourist revenue factor, and controlled, seasonal hunting has resumed. Even here in the Adirondacks, the return of beaver, small numbers of moose, and some bird species have already brought new revenue to local coffers. While the increasing numbers of deer and black bear constitute Adirondack mega fauna today, in the not so distant past, the ecosystem of the “forever wild” Adirondacks supported wolves, cougars, lynx, wolverine, moose, elk and wood bison. Today, moose, recovering from a history of unrestricted hunting, probably number a very sparse 800 to 1,000 animals in New York, and the DEC is engaged in surveys to get a better handle on moose numbers, and whether they are increasing or, following the current trend in Maine, New Hampshire, Vermont, Minnesota and Montana, decreasing. Studies indicate that potential wolf recovery areas include the Adirondacks and northern New England. At Adirondack Wildlife Refuge, we frequently receive photos of “Eastern Coyotes”, or what we call “coywolves” from Facebook followers, all asking whether these are “wolves”. 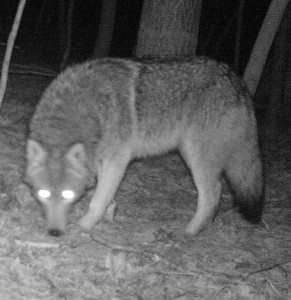 The coywolf is a wolf-coyote hybrid, and as the accompanying photograph from a trail cam at the Adirondack Wildlife Refuge shows, coywolves are sometimes twice the size of western coyotes, and often difficult to distinguish from wolves, especially for a layman who sees one for only a few seconds. The largest obstacle to wolves returning to the Adirondacks is relentless hunting and trapping of wolves in southern Quebec and Ontario. 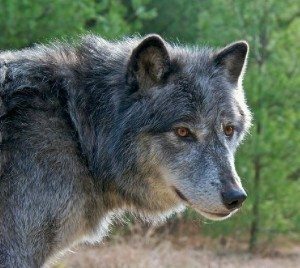 For our purposes, bolstering the Adirondacks as a place where visitors may see wolves, is it so critical what percentage “wolf” our wolves are, when few visitors can distinguish gray wolves from Canadian wolves from coywolves? Wandering, transient male cougars occasionally pass through the Adirondacks, but there is no evidence of female cougars raising kittens and defending territories anywhere east of Missouri and the Michigan Upper Peninsula. 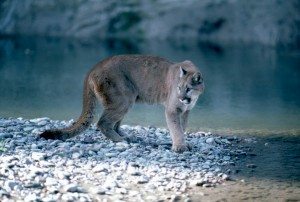 Male cougars will set up territories when they have sufficient prey, which they have in the Adirondacks, and female cougars in territories overlapped by their territories. Unlike the confusion between coywolves and wolves, it’s less difficult to mistake a cougar for, say, a bobcat or lynx. Without reintroducing cougars to the Adirondacks, particularly females, it is unlikely we’ll have a breeding population in the Adirondacks. Starting in 1893, more than 300 Rocky Mountain Elk were released in the Adirondacks over six years, but were extirpated by hunting, poaching and the expansion of white tailed deer, who passed brain worm and round worm to the elk. Other than that experience, mentions of elk are only found historically. Wood Bison have probably been gone for over 200 years, and I don’t believe there have been any specific studies about whether the Adirondacks, logged, cleared, reforested and generally altered over time, would offer suitable browse for elk and grazing for bison. Lynx are occasionally reported in New York, but as with cougar, there is no evidence yet of breeding and setting up territories, although Sue Morse of Keeping Track has encountered them in northern Vermont. Eighty lynx from northwest Canada were radio collared and released in the Adirondacks, over a three year period starting in 1989 and some dispersed up to 400 miles from the release areas. Unlike the bobcat, which has a more generalized prey base, and whose numbers continue to expand in the Adirondacks, lynx are specialized snowshoe hare predators. Wolverine were last reported in New York in 1840, and their smaller cousins, fishers, are doing well here, and expanding their ranges in New York State. Previous reintroductions of mega fauna often suffered from lack of funding for follow up. 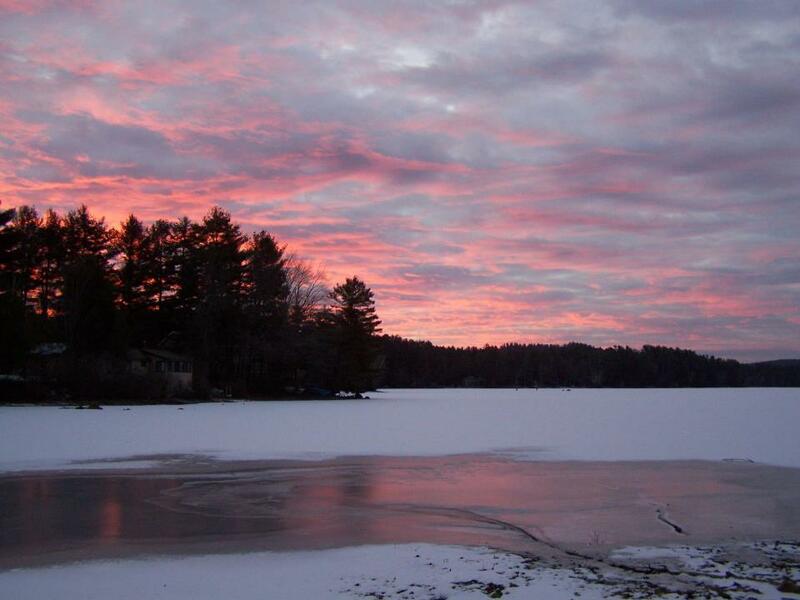 The Adirondacks, Yellowstone of the East? Does all this mean that we could turn the Adirondacks into the Yellowstone of the East, by rewilding mega fauna? Well, not exactly. From a wildlife perspective, much of the allure of Yellowstone is its wide open vistas, meaning it’s much easier to spot large animals, while the Adirondacks is more characterized by mixtures of thick conifer and deciduous forest. 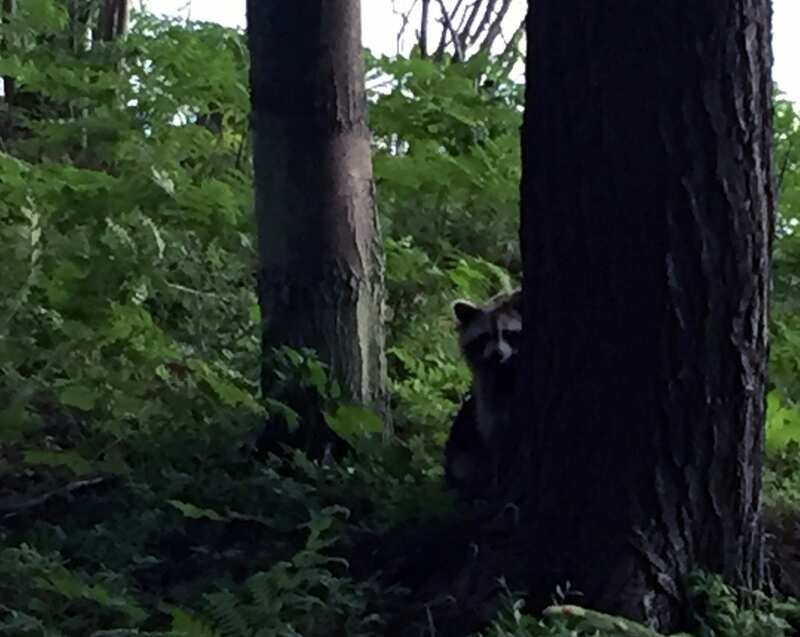 As in many forested wildlife environments, when you hike in the Adirondacks, critters tend to hear you, see you or smell you, and flee before your approach, which is why you’re more likely to see wildlife while canoeing, or surprise wildlife while driving. 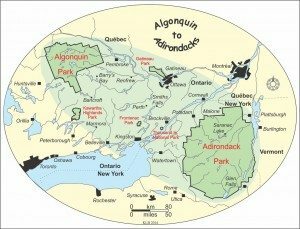 There is a much better model for a rewilded Adirondacks, and that is Algonquin Provincial Park in Ontario, about two hundred ninety miles northwest of Lake Placid. Both parks are part of the Southern Canadian Shield, and are generally characterized as Eastern Boreal transition ecoregions. The Adirondacks has mountains, while Algonquin features rugged and rocky hills, but both have many lakes and waterways, and both are visually inspiring. Algonquin forms a wildlife corridor with the Adirondacks, and comprises the northern end of an important gene exchange with the Adirondacks, mixing gene pools, as animals wander back and forth between ecosystems, just as the Adirondacks forms such a corridor with the Catskills and Appalachians. One of the most important challenges for parks and wildlife refuges is the dangers of genetic isolation, which impacts diversity within a species, or as we put it at the Refuge, “the key to wildlife survival is connected habitat”. Algonquin has populations of Eastern Canadian wolves, deer, beaver, and may be the surest place in North America to see moose. 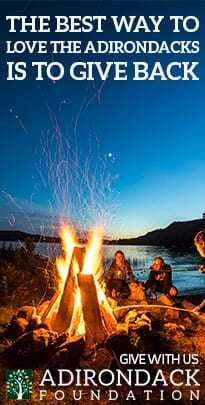 Forty miles of Highway 60 runs through the southern end of the Algonquin Park, and is bordered by many bogs, beaver ponds and meadows, which attract moose at various times of year. Algonquin is also the only park I’ve visited, besides Yellowstone, where I’ve seen wolves multiple times. Curiously, Highway 60 somewhat mirrors Route 3 in the Adirondacks. Picture, in particular, that sparsely populated, 40-mile long stretch of Route 3 between Tupper Lake and Star Lake, and like Highway 60, passes through areas where the forest is interrupted by lakes, bogs and beaver ponds, or the stretch between Paul Smith and Malone, or Tupper Lake and Old Forge. The secret to successful wildlife tourism is often not only what you are very likely to see, but what you believe you may see. 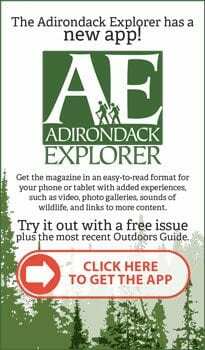 Imagine if we added to the various reasons to visit the Adirondacks, wildlife viewing, the outside chance of seeing a moose browsing in a beaver bog, or hearing a bull elk bugling in a meadow, or seeing a wolf or cougar crossing the road. Even if we had cougar and wolf, the chances of seeing them in, say, the High Peaks area, would be very low, as there are fewer deer there, and too many people. If you’re staying at one of the large hotels in Lake Placid, where according to ROOST, most Essex County lodging dollars are spent, you may decide to take that picturesque drive from Saranac Lake through Tupper Lake and beyond. What if you’re running a motel, inn or bed and breakfast in Tupper Lake, Cranberry Lake or Star Lake, and you add wildlife viewing to that list of amenities on Trip Advisor, Home Away or AirBnB, and feature photographs of wildlife taken by your guests? 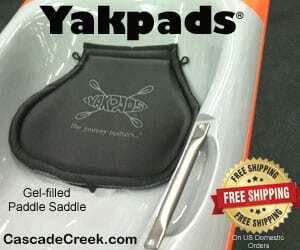 What if you are a hunting or fishing guide, and you’re operating in an increasingly wildlife rich Adirondacks? A rewilded Adirondacks would have a major tourist advantage over Algonquin. While Algonquin is only about a four hour drive from Toronto and three hours from Ottawa, the Adirondacks is within driving range of the much more populous New York, Buffalo, Boston, Albany, Hartford, Burlington and Montreal metro areas, and has a more robust hospitality infrastructure. In addition, access to Algonquin is remote, and once you’re within 100 miles of the east or west gates, you’re on two lane roads. There are a number of non-profits currently working on rewilding, with habitat specialists and biologists taking a fresh look at an old topic, because they have learned much more about our habitat and its carrying capacity for wildlife, and like many others, they view the preservation of the wild as a legacy and a duty. They also see what is happening on the Federal level, and are thinking this may be an opportunity for visionary business, civic and both state and local political leaders, to examine a potential broadening of the Adirondack economy, and step up to promote a real return to “Forever Wild”. Photo of the wolf courtesy Julie Clark. Steve and Wendy Hall run the Adirondack Wildlife Refuge and Rehab Center in Wilmington. They've been rehabbing and releasing wild animals for over 35 years, specialize in predators, keep wolves as the cornerstone of their educational program, and have lived in the Adirondacks for the past 13 years. 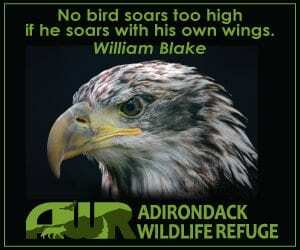 The Adirondack Wildlife Refuge became a non-profit about 4 years ago. 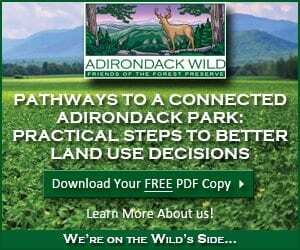 Visit www.AdirondackWildlife.org to learn more. Not only is rewilding aesthetically appealing, to think of the Adirondacks as more wild and more restored to its natural balance, but Steve’s point that it can make economic sense too needs to be digested by all who are interested in promoting the park. His descriptions of the economic benefits of wildlife viewing in Yellowstone are right. The thought that we could capitalize on an Eastern version of that is intriguing. I’ve always wanted to see the wolf, cougar and lynx return to the Adirondacks but this sheds new light on the potential benefits to be had. Great column, Steve! Can anyone explain to me why this comment is a “hot debate”. Why are there “down votes” to a comment that says “great column” and it is an intriguiing and something Mr. Nelson would like to see. Baffling to me… Why be negative just to be negative? If you havea a differing view, express it. Elk are not historically associated with the Adks. Herds of elk populated the surrounding lowlands, but there is no evidence of elk in the central Adks. The main reason the elk introduced in the 1890s died is that they were put into unsuitable habitat. 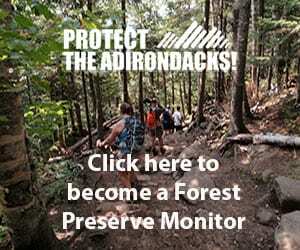 You don’t really need to “re-wild” the Adirondacks to promote wildlife viewing. It is just a matter of getting people interested in looking at the wildlife we already have. I have seen the following in the Adirondacks and each time was a treat. Deer, Moose, Coyotes, Bobcats, Pine Martins (that was a real treat! ), Fisher, Mink, Weasel (a beautiful white one with a vole in it’s mouth a few weeks ago! ), etc. etc..
People just have to get out there and take the time. I would argue that a eastern version does exist. Sure you can re-introduce wolves and mountain lions if you want but seeing either of these animals in a habitat like the Adirondacks is going to be very tough. We don’t have the big elk herds and open spaces that make seeing wolves in a place like Yellow Stone much easier. So even if we don’t go to all this trouble and expense to re-introduce the large predator species there is still plenty to view and take advantage of the economic opportunity Steve describes. Well even if there was no economic benefit – which I don’t think is true… Ecologically – it is absolutely important to have apex predators – for it to be truly healthy. We already have apex predators. The coyote wolf hybrids act just as wolves would. They are pack hunters, unlike the western coyote or eastern for that matter. The ADK doesn’t have an over abundance of any animal, except for the beaver maybe, but certainly not the deer! Also, maybe they should look at improving the deer herd as a means to improve the economy. 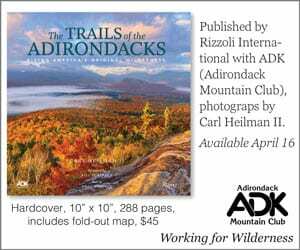 The ADK was once a destination for deer hunting. Now, populations of deer and hunters are dwindling. There is not one single cause for the decline, but a combination of factors. Timber management is probably one that we could control the most. Logging used to be much more prevalent in the Adirondacks. This created a nice balance of young succesional forest and edge habitat, that benefitted a whole host of species in addition to deer. Loggers also used to leave tops, which provided a much needed food source, especially in winter. Unfortunately, logging practices have changed. It is seldom done, and when it is, they do not leave tops. Every thing is chipped due to the new bio mass plants. Chips are now the most valuable wood product. The state needs to start managing their forests better. Besides benefitting wildlife, a great deal of revenue can be generated. Unfortunately, some very important wintering swamps have also been cut, which severely hurt the deer population. I won’t touch much on supplemental feeding, but I believe, if done properly, can be a big benefit. The DEC’s excuse is that it congregates deer, making them succeptible to disease, and that it puts them over carrying capacity of the land. Currently we have no real disease threats to the deer population. If a disease appears, then you can put a temporary ban on feeding. In western states, where they value the economic value of their wildlife, they have air-dropped food during tough winters. I might also add that CWD is much more prevalent in these places. The deer population isn’t remotely close to be over their carrying capacity either. The DEC treats the deer populations in other more populous parts of state the same as it does as in the ADK. They hand out deer mangagement permits to timber companies that have no business shooting does. The forest regeneration is in no danger from deer currently. I just think we need to fix what we have first. Thank you for sharing. The conversation of economic development in the park is always a topic of conversation, and unfortunately the idea of rewilding as part of economic recovery rarely sees the light of day. 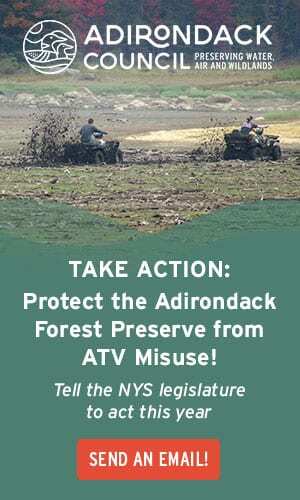 Reintroducing once vilified and eradicated wildlife would be a great step forward in restoring the Adirondack park. Even more so with the chance for new revenue opportunities. Take the Adirondack Scenic Railroad or WW Durant for example. Would there be an increase in passengers if there was a higher possibility to see a moose, wolf, elk, bear, or mountain lion? What a terrific article! 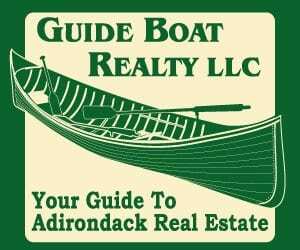 My family and I have been vacationing in the Adirondacks most of our lives, and for the past 15 years or so own a cottage colony on Blue Mountain Lake. We would LOVE to see these creatures reintroduced to their old habitats, both because it is right on so many levels but also because, as Mr. Hall points out so well, it would give visitors an added impetus to come to our region. From spending time with our guests I can tell you from direct experience that a great many people come to the Adirondacks hoping for glimpses of deer, bear, beaver or moose. We feature wildlife on our webpage; frankly, with so many guests wanting to see them we’d be foolish not to. Sometimes our guests hopes are rewarded, but even when they don’t always see our larger creatures, the very possibility of seeing wildlife — just knowing there are moose and bear here, for example — gives people a thrill. It is part of the allure of the Adirondacks, the very romance of wilderness, and it draws people here, just as Mr. Hall observed. Restoring wolves, cougar, elk or woodland bison would, I believe, increase visitors exponentially, and equally important – encourage them to stay longer once they are here. Obviously, it is not only cottage colonies like ours who would benefit from an increase in tourism, but the local gas stations, stores, museums, art centers, etc – in short, most of us up here. 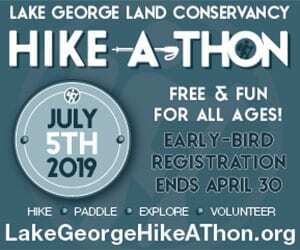 This seems to me a win-win situation; our local economy is boosted, our wildlife restored, and the number of people who frequent our park, come to care for it and bring their friends and family here, grows. In an era where more businesses are discovering the very real economic benefits of going “green”, I think you’ve hit the nail on the head with this article. Thank you! In contrast Denali National Park being of nearly equal size to the Adirondacks has 92 miles of roads. Yellowstone is 2.2 million acres and has 466 miles of roads. Death Valley which has more miles of roads than any other national Park, has 1,300 miles, only 300 of which are paved. Small drive in Parks are everywhere. People travel across the world to find true wilderness. We could have it here but sadly we don’t. Even with the Forest Preserve lands, particularly the new acquisitions, it seems the greatest focus is placed on human access and human recreation. We want to be able to drive as close as possible to begin our mountain hike, bike trip, hunting, fishing etc…It is great that we are finally getting UMP’s done but the main focus always seems to be carving them up for every special interest recreational group. I am not saying human recreational use is incompatible but we don’t seem to have adequate limits or balance. While the Adirondack Park will never be as wild as Yellowstone or Denali, there should be a clear plan in place to help it recover and move towards returning it to it’s natural state. I think we are lacking in one and question if that is truly a goal of the state. Lastly wasn’t the Harbor Seal found in Lake Champlain? That would be an interest reintroduction? I wonder what affect their reintroduction would have on Cormorants. Scott, do you think the un-wildness of the Adirondack Park (I agree it is a different type of wild place in comparison to the places you list) would make the introduction of these large predators possible? Seems like a lot of roads for these cats and wolves to deal with? Bears seem to be doing very well so maybe it isn’t an issue. If I was a wolf I don’t think I would stay in the Adirondacks. I think I would head straight for agricultural areas to the south where there are far more deer and other prey that is very easy to kill and eat. And I think there is a good chance that I would get hit by a bus or shot on the way! I think this idea is good in theory but in practicality it seems like a non-starter? There is no such thing as easy prey… Half of their hunts end up with nothing. Reality is that if wolves have adequate habitat they stay away from people. They are social animals. 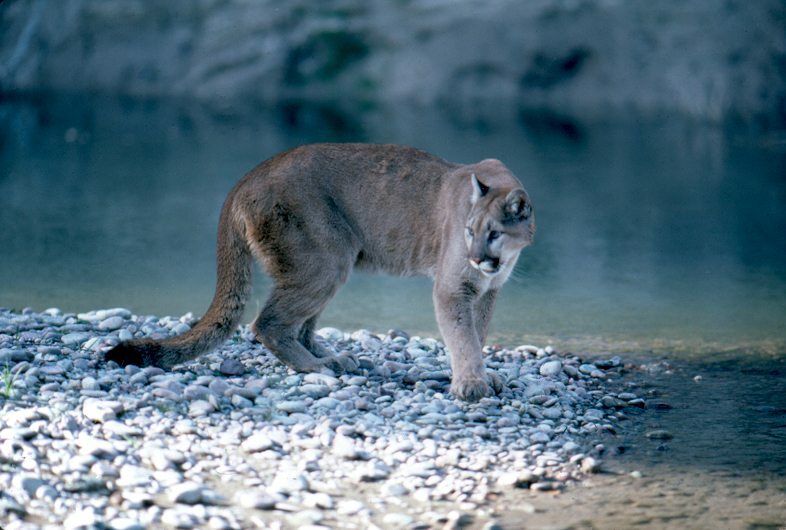 Cougars on the other hand will live in suburbs next to dense cities – since they are solitary and very quiet. The live right next to Los Angeles and San Francisco… They would have zero problem making a living in NY anywhere north of Westchester County – downstate. Paul, I am not a biologist but I think restablishing these apex predators is possible. Modeling for all the influences of a reintroduction here would be difficult and probably impossible to be inclusive of everything. There will be significant highway mortality. Reintroductions can fail in one attempt and in the next attempt the species flourish. These predators disperse for a variety of reasons. It’s not as if they know there is agricultural lands to the south but given the proximity of the Adirondacks to high human population centers we should expect movement and interactions like occurred with Lynx. An issue I think is the amount of suitable habitat within the Forest Preserve. The majority of these lands are upland. They were acquired by the state because once logged, capitalism dictated they had no value. More productive lowlands, for us, and wildlife stayed in private hands. We did a great job protecting the high elevations and our rock and ice areas but not nearly are well protecting areas these large mammals actually live. The public seems more accepting of these ideas than in the past I don’t think it’s a non-starter. They do have red wolves in North Carolina so I guess perhaps it could work. It seems like we have better deer populations as you go more out from the center of the park. Especially moving south. If you look at hunter success we see a much better shot at finding deer as you move away from the more protected areas on the park. It almost seems like there would be a natural draw away from the areas where we would want the wolves to be and where they would have the best shot at survival. One big difference here on re-introduction in the east and the Adirondack Park is that we would be doing it, not in a park that might be near farms or ranches, but in a park that actually HAS farms. Gonna be a tough sell. Paul, the Red Wolves in NC are confined to our coastal plain, primarily the Alligator River NWR. They didn’t work out in the Great Smoky Mountain NP because of low reproductive rates, and high pup mortality, in spite of the extensive food base (elk, deer, wild hogs and small game). Based on what I’ve seen, the habitats of the GSMNP and the AP are very similar, except the National Park is 816 sq. miles of contiguous habitat with no permanent human habitation or private in-holdings. Most of the 384 road miles within the park are concentrated along the edges, mostly along the Tennessee park boundary. US 441 more or less divides the park in half crosswise. We’re learning more and more about the necessity of having large, contiguous areas of habitat for the survival and well-being of certain species, and that’s no guarantee. The Lynx program didn’t go well here. There is probably a lot to learn from that program if you want to be (or could be) successful with wolves. But the wold re-introduction in Yellowstone was pretty easy. They just dropped a few dozen wolves in there and bam! I am not so sure your ‘miles of road’ to total size is actually germane. The Adk’s after all is not the same type of park. The questions of suitable habitat needs to be centered on the public land as there are no hamlets or villages or Lake Placids inside a Yellowstone or Denali, the presence of towns makes the comparison abstract. To me the question really becomes whether there is enough conjoined public land to provide a large enough space to support the vanquished mega fauna. If there is then I would vote to give it a try. The appeal of the Park is it’s dedication to the “Forever Wild” environment enveloping the areas of human habitation. Mr Hall proposes an idea entirely in keeping with that ideal. Wayno, The Adirondack Park is certainly different, obviously our “high intensity recreational facilities” are spread through out the Park, kept in private hands and not clustered on Park Borders. National Parks do however have roads, buildings and significant infrastructures inside of them, just they way the Adirondack Park does. Millions of People go to the Grand Canyon in a year but only thousands venture interior. The same can be said for visitation at Lake Placid vs actually hiking into the High Peaks wilderness. There are differences in the comparison yet enough similarities that make it germane. psychological aspects are not degraded.” Are we really following this? Wayno, my point was that the vehicular road miles in the GSMNP, including dirt roads, are mostly confined to the periphery, except for one road, US 441. Over 90% of the habitat on either side of 441 is, as you say, conjoined wilderness. Further, I was trying to say that even with plenty of quality habitat and food resources, re-introducing an apex species can be a crapshoot, as happened with the Red Wolf in the GSMNP. I’m curious, how large is the single largest unbroken piece of Adirondack wilderness, without vehicular roads? Heavy, I can tell you why it is a hot button issue. It will used as a tool by the Environmental lobby in Albany as in western states to eliminate recreational groups from the park. 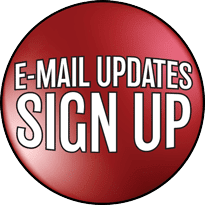 Good opportunity to voice new ideas regarding Steve’s post. There are also wolves in Gatineau in Quebec… right on the border of the city of Ottawa.. People go on tours there just to hear the wolves. Good point, AG. I started going to Isle Royale National Park and the Boundary Waters just to hear wolves. Not necessary to see them. Just knowing they are there makes all the difference. ‘Rewilding’ sounds great & the comparison to Algonquin is apt.